OS X 10.9 Mavericks promises more than 200 new features, but many of those aren’t the kinds of things you’ll see plastered across Apple’s website. Some instead are found in subtle changes to application and system settings. As part of our comprehensive coverage of Mavericks, we take a look at OS X’s System Preferences utility, pointing out the differences between Mavericks and its predecessor, Mountain Lion (OS X 10.8). 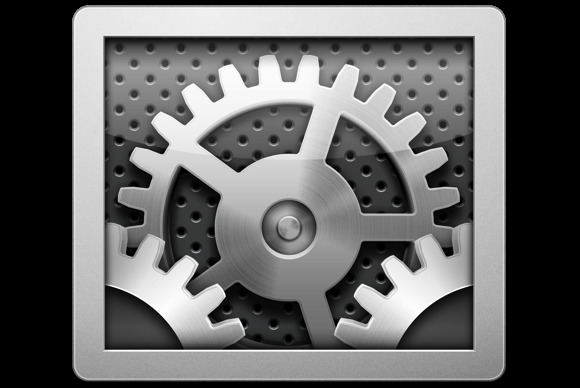 The first thing you’ll likely notice, if you’ve spent a decent amount of time in the System Preferences utility in the past, is that the icons for the individual preference panes are slightly larger, and Apple has updated some of those icons, such as the one for iCloud. The System Preferences application no longer labels each row. 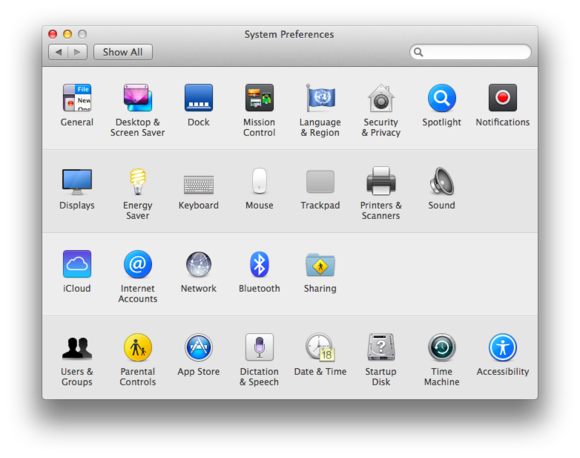 The second general change is that while System Preferences still organizes individual preference panes into rows, it no longer displays the category names present in earlier versions of OS X: Personal, Hardware, Internet & Wireless, System, and Other. In OS X 10.8 and earlier, when enabling LCD font smoothing, you could opt to have the OS disable smoothing for fonts smaller than the size you specify, presumably because smoothing didn’t always work well at small font sizes. In Mavericks, this option is gone—font smoothing is either on or off. Your options in the Desktop & Screen Saver pane haven’t changed, though you of course get a new desktop photo—the Mavericks-inspired wave image. There are no changes here, either, though I'm quite sad that the trick to revert the 3D dock to the (much better, in my opinion) 10.4-era 2D appearance, which has worked in every version of OS X since 10.5, doesn’t work in Mavericks. You get one new option here: Displays Have Separate Spaces. With this option enabled, you can set up separate Spaces workspaces for each display. With this option enabled, workspaces will switch independently, and if you use a keyboard shortcut or gesture to switch workspaces, that command affects only the display containing the pointer—the other display remains in the current workspace. Apple has completely revamped this pane in Mavericks. Instead of separate tabs for Language, Text, Region, and Input Sources, you now get a single screen for choosing your preferred languages, region, first day of the calendar week, calendar type, and time format. Apple has dramatically simplified the Language & Region pane. Unlike in OS X 10.8 and earlier, which displayed all languages—you could only rearrange the order of preference—in Mavericks you choose only the languages you actually use and, if you have multiple languages enabled, their order of preference and systemwide sort order in lists. Where did the rest of the settings formerly in the Region tab go? At the bottom of the window is an Advanced button that reveals settings for formatting dates, times, and numbers. The resulting sheet’s General tab includes the Format Language (formerly Region) setting, as well as options for number separators, currency symbol and punctuation, and measurement units. You can choose different settings for each format language. The Dates tab includes the settings you previously accessed using the Customize button next to Dates, and the Times tab gives you the settings previously accessed via the Customize button next to Times. The settings formerly in the Input Sources and Text tabs in OS X 10.8 are now found in new Input Sources and Text tabs, respectively, in the Keyboard pane. You’ll find a few minor changes here. In the General tab, the Disable Automatic Login option is gone—it remains only in the Login Options screen of the Users & Groups pane. (In OS X 10.8, it appeared in both places.) The Require Password After pop-up menu also no longer offers a 4-hour option—1 hour is the longest delay available. The Privacy tab now lets you approve app access for your personal data, as well as approve which apps can use the Accessibility system to control your Mac. The Privacy tab, which is where you configure which apps have access to particular system services, still includes Location Services, Contacts, Facebook, Twitter, and Diagnostics & Usage. OS X Mavericks adds categories for Calendars, Reminders, and Accessibility. This pane remains the same, with one (very) minor exception: In the Search Results tab, the Messages & Chats category is now called Mail & Messages. 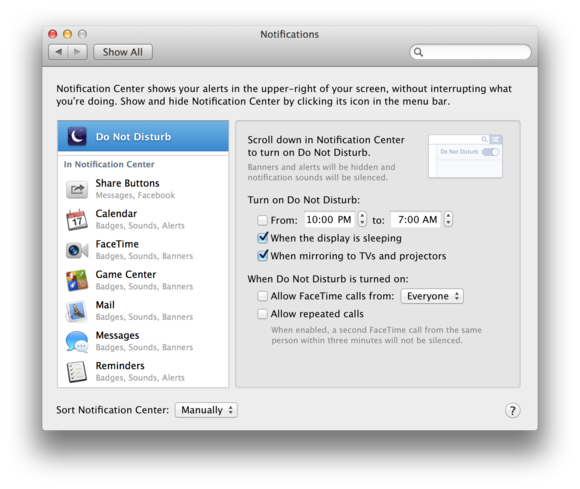 This pane for managing Notification Center includes a couple major changes. The first is a new iOS-style Do Not Disturb option. Select this item in the list on the left, and you can choose particular times and conditions (when the display is sleeping, when it’s mirroring to a projector or TV) during which you wish to disable notifications. You can optionally choose to allow FaceTime calls during Do Not Disturbe time (from everyone or only from Favorites), and allow someone to “break through” by calling repeatedly. Mavericks now offers an iOS-style Do Not Disturb feature for Notifications. The second change is that within each service’s or app’s notification preferences, there’s a new option, Show Notifications On Lock Screen. With this setting enabled for a service or app, notifications appear on your Mac’s lock screen. This pane now shows up only if you’re using a Mac with an internal optical-disc drive (or a connected external optical-disc drive). Your text shortcuts from your iOS devices now sync with those on your Mac, and vice versa. 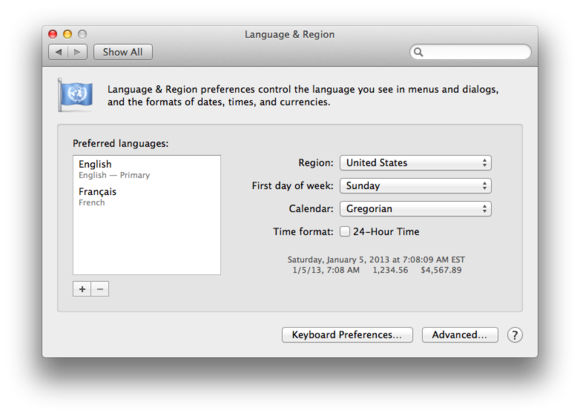 The new Text tab contains the settings previously found in the Text tab of OS X 10.8’s Languages & Text pane. Missing is the Word Break option, and you may notice that the text substitutions list—which lets you enter longer snippets of text that are automatically inserted whenever you type your chosen text shortcut—no longer shows all the (useful) default snippets and symbols provided in OS X 10.8. That’s because starting in Mavericks, your substitutions list automatically syncs with the text-shortcuts list found in Settings > General > Keyboard under iOS 6 and iOS 7—anything you add to this list in the Text tab syncs to your iOS devices, and vice versa. Apart from the name change, this pane remains the same. There’s only a single change here, and it’s subtle enough that few users will notice it: A horizontal line separates locally connected audio-output devices and AirPlay destinations. In addition to getting a sky-blue icon in place of brushed aluminum, this pane has a few minor changes in its list of items to sync via iCloud. Instead of one Calendars & Reminders item, you see separate items, Calendars and Reminders. Also, the Documents & Data item, when enabled, now has an Options button—click it to see a list of apps that store data in iCloud. There’s also a new Keychain entry. Enable this option to use the new iCloud Keychain feature in Mavericks and iOS 7. Mavericks adds LinkedIn as a social service to which you can connect. This pane’s new name better reflects the various settings it hosts—with the addition of Twitter and Facebook integration in Mountain Lion, the Mail, Contacts & Calendars designation was a little confusing. 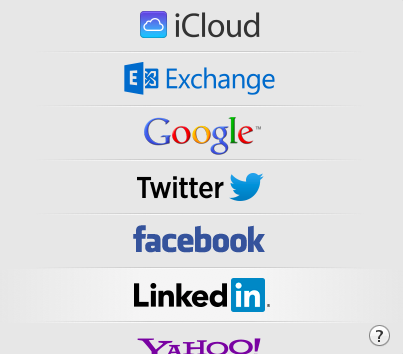 In addition, when configuring a new account, you’ll see Google listed instead of OS X 10.8’s. You also get the option to add a LinkedIn account; Facebook settings include access to your calendar(s); and, when viewing the settings for an iCloud account, you see the same new options found in the main iCloud pane. This pane remains the same in Mavericks. Mavericks gives this pane a considerable makeover, with the aim of making it simpler and easier to understand—and, in some ways, more like iOS’s Bluetooth-settings screen. Apple has streamlined the Bluetooth pane in OS X Mavericks. You no longer have to specifically click the plus (+) button to initiate a new Bluetooth-device pairing. 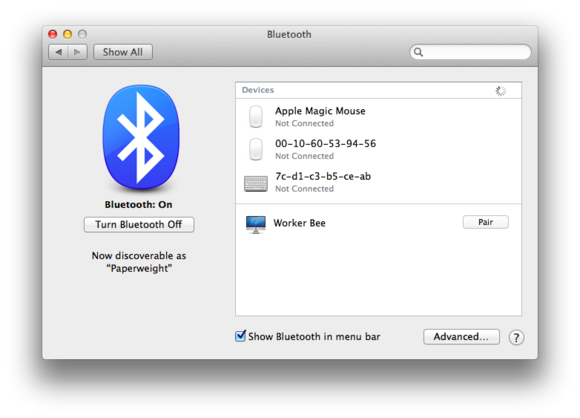 Instead, any discoverable Bluetooth device in range of your Mac appears here with a Pair button next to it; you just click that button to pair your Mac with it. Already-paired devices appear in the same list, with an X button to remove the pairing. Gone is the old Sharing Setup button (all it did was take you to the Sharing pane), as well as the Discoverable on/off toggle (your Mac automatically becomes discoverable whenever you open the Bluetooth pane). Also absent are a few options in the Advanced-options screen—specifically, the Reject Incoming Audio Requests option and the option to add a Bluetooth serial port. Apart from some minor word changes and aesthetic rearrangements of options, the only change here is a new option in the Other tab (when configuring an account’s controls) to disable use of a Mac’s built-in camera, a camera built into a connected display, or a USB camera. The big change here is a new option to automatically download and install updates to apps purchased from the Mac App Store. A new option called Use Enhanced Dictation, when enabled, downloads nearly 800MB of data that allows offline use of OS X’s dictation feature, along with continuous dictation and live dictation feedback. 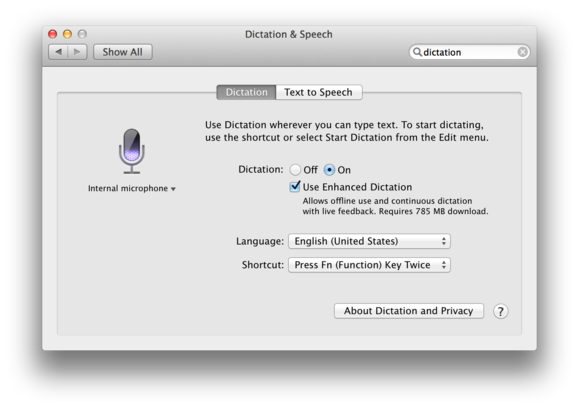 Turn on the Use Enhanced Dictation feature in Dication & Speech for live transcription and more. You also get some new ‘Text to Speech’ voice choices. Gone from this pane is the option to have an application make an announcement when it requires your attention. The Accessibility pane in Mavericks looks a lot like it did in Mountain Lion. It’s organized into two panes, with the left pane broken into three categories: Seeing, Hearing, and Interacting. However, there are a number of new groups of settings here. Captions: You use the new Captions settings to control how subtitles are styled and whether your Mac should give preference to closed captions when those are available. There are three basic caption styles to choose from: Default, Classic, and Large Text. Classic mimics the white-on-black blocky caption style you’re familiar with from television; the other two aim for subtler looks. You can style captions on OS X Mavericks to your liking. If you click the plus button in the Captions screen, you can create your own caption style. Whichever existing style is selected when you click the plus button becomes the basis of the new style you create. You can tweak colors, fonts, sizes, and more. 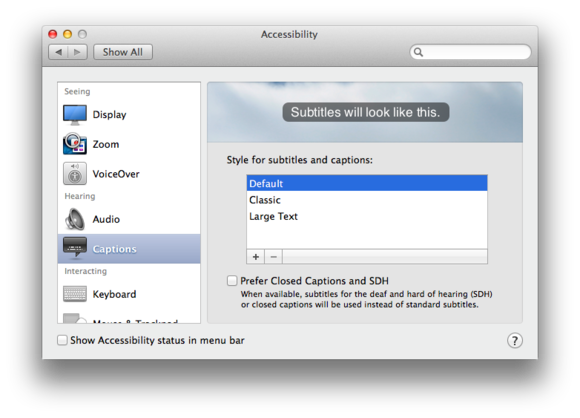 If you check the Prefer Closed Captions and SDH box, Accessibility displays subtitles for the deaf and hard of hearing when possible, in lieu of less-informative standard subtitles. The Captions feature works only with content that includes caption data, of course—for example, when playing captioned videos in iTunes. Switch control: New under the Interacting header is Switch Control, which lets you control your Mac using one or more switches. Switches might be a mouse, keyboard, gamepad, or dedicated assistive device. Unless you need the feature, you probably won’t want to enable it. But with Switch Control enabled, you use hardware devices to control customizable on-screen controls for accessing features like the Dock, menu bar, cursor, keyboard, and more. Accessibility and security: You might rely on apps that leverage OS X’s built-in Accessibility technologies and not even know it. 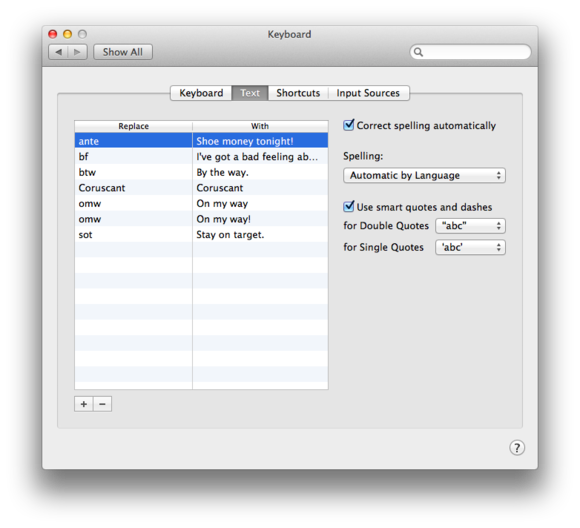 Apps such as Smile’s TextExpander and Many Tricks’s Moom and Witch all rely on Accessibility settings on your Mac. 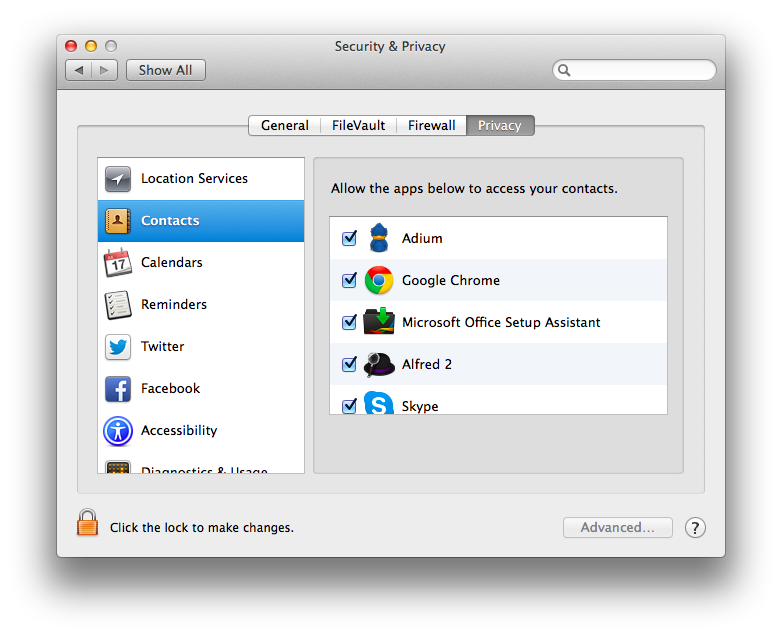 The preference to allow apps to access these features has moved in Mavericks. To find Accessibility, go to System Preferences > Security & Privacy and click the Privacy tab. (You may need to click the lock icon at the lower left and authenticate with your administrator password.) Then scroll down to Accessibility, and drag into the list any apps to which you’d like to grant such permission; if an app has explicitly requested such access, it will already appear here.